What better way to introduce history to a new generation then by presenting a comic that is trying to correct history? This is reminiscent of Mr. Peabody or Little Einsteins and other cartoons. This may not been a new idea or format of history telling but it is compelling for the demographic they are aiming for. I love this type of stories but I always felt that they lacked an accurate historical breakdown after the adventure. This is what makes this novel so different! There is a final summary of the correct history at the end of the story. Also, there is a pun in the tittle! What are you suppose to do if history changes and you and your classmates are the only ones who know about it? You fix it, obviously! 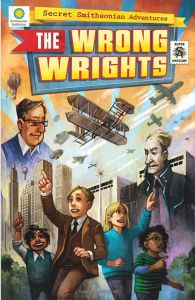 The Wrong Wrights is intriguing because it depends on the innovation of the children, their analysis, and their creativity. Although at times they seem innocent, they are not gullible and are worldlier than the average child. Unlike many stories that has the correct history, the children are not geniuses or depending on a genius to help but they depend on their passions. This makes the narrative more fun to read and more interesting to experience. They are not totally alone; they have a guiding hand that does not disrupt the children’s findings. Top that off with diverse characters, interests and equal treatment, the readers of The Wrong Wrights will feel that they can relate to the story no matter who they are and what their experiences are. 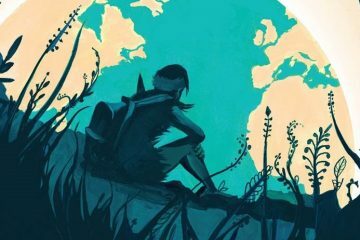 The experience of the story is always enhanced by the art in a graphic novel. The art in The Wrong Wrights is a marriage of Disney-esque styling and propaganda posters (examples). The marriage has an amazing affect on the story. The style has an innocence and childish wonder, which is perfect for children’s books. It also emphasizes the idea that there is an exploration of history and an idealism of the American life. Combine those sentiments with beautiful imagery of the buildings and scenery throughout time and the reader gets an idea of the era and the landscape of the time portrayed. It even gives the reader a sense of where the story is taking place. It was an interesting experience of seeing art meets time. 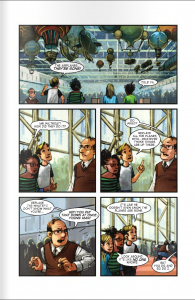 The graphic novel is a small piece with the typical structured panels. The Wrong Wrights is easy to read and follow perfect for children’s literature. The story is complex at times but quickly explained and summarized for the reader. It maintains that this is a work of fiction using history as a platform. Buy it for your kids, not for you. The story is fun to read and interesting but as an adult the correct history page would probably satisfy you. The children are those who would benefit the most and learn the most from the experience. It shines for its simplicity that matches the target market’s capabilities and it’s great for story time. The Wrong Wrights is intriguing, fun and educational as a story. The art is great for the medium and the piece. Also, if you don’t actually know the historical story, it would be a great experience to read this with your children! Grab your kid and have fun reading The Wrong Wrights! Buy it here! For other options look here!